A number of people have read my post on the Spafford/Spofforth/et al family history. 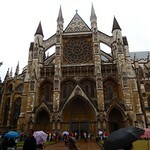 That was part of a longer trip to England that was part family vacation, and part graduation gift to my daughter. Overall, we spent 10 days in England. It was a first visit for my wife and daughter, and about my 8th or 9th so far. 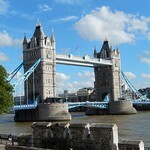 We had a great time on the vacation, starting in London. We saw a lot of the usual sights — The Tower of London, Tower Bridge, St. Paul’s Cathedral, Harrod’s, Westminster Abbey, the Houses of Parliament, the British Museum, the new Globe Theater…. We also enjoyed simply walking around, sampling the food, and seeing various sights. After that, we took the train to York, and spent several days touring there, including the side trip to Spofforth Castle. 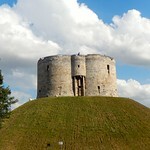 York is a wonderful place to visit — so much history in that city, and all within a short walk. We wish we had had several more days there. If I get time, at a later date I may write up some of my recommendations for travelers on this blog. However, I can highly recommend York as a place to visit for anyone interested in history. 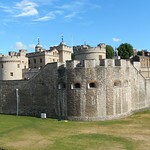 The main point of this post, however, is how wonderful we found the service at the three Hilton hotels where we stayed. 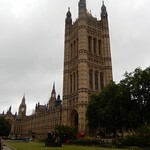 In London, we stayed at the Hilton Metropole. The hotel is in the latter stages of a major renovation, and we got some of the new rooms. Travelers from the US often find European (and elsewhere) hotel rooms small and cramped, but the rooms we stayed in were “US scale.” More importantly for us was the staff. Everyone we met was friendly, helpful, and went “that extra kilometer” to answer questions. The concierge did a fantastic job with his recommendations, including not only tourist sites, but pointing us to interesting pubs and providing us with tips on getting around. (There is an Underground station almost across the street; with an Oyster card, it could hardly be easier to travel.) In the restaurant at breakfast, one server got to know us so well that while I was in line waiting for a table she prepared a cup of “American coffee” for me before I even sat down! In York, we stayed at the Hilton York. These rooms were typical European size, but neat and clean. The view was outstanding — I would look outside my window and see Clifford’s Tower across the street (although it was the side with the garderobe — thankfully, no longer in operation :-)). The location was convenient to everything we wanted to see in the old city, and the restaurant was wonderful, too. 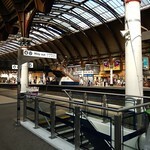 What really made our experience in York, however, was the above-and-beyond service by the concierge. I had originally reserved a car with National Car Rental for the Sunday we were there so we could travel to Spofforth. I had a confirmation for a car with automatic transmission (driving on the left would not be a big challenge; working a manual transmission on the “wrong side” at the same time would have been too much). The rental office was normally closed on Sundays, so I checked in at the office when we arrived Friday to see how we would get the car — only to be informed that there was no car. A confirmation number made no difference (“They should have mailed you that we don’t have automatic transmission cars.”). None of the other rental places at the train station had available cars for Sunday, either. Had I shown up Sunday morning for the car, I would have been very rudely surprised — not that it wasn’t a rude surprise at the time. When we arrived at the hotel, somewhat crestfallen at this news, I asked the concierge if he could suggest alternatives. He said he’d get back to me. Over the course of the next hour, he checked all the other major car rental locations in the immediate area (no cars available), then had checked with several local cabbies and services. He found one willing to drive us out to Spofforth and back for a very reasonable charge, and who would pick us up at the hotel Sunday morning despite streets in the area being largely closed for a charity marathon; we’re still not sure how he managed to get a spot in front of the hotel to pick us up. The driver entertained us with stories about the countryside to and from Spofforth, and the whole episode ended up being cheaper than renting the car — even when factoring in the train tickets to Manchester instead of the one-way rental. Yes, that was our way back to the US. From York, we went to Manchester. We spent the night at the Manchester Airport Hilton (why break a streak?). The rooms were great, and once again, the service was wonderful. By this point, my wife & daughter were both a little fatigued from travel (I travel so much, I am used to almost anything) and were a bit picky about dinner. Our server at the hotel restaurant, Masons, went out of his way to be accommodating, including getting the menu from one of the other venues in the hotel with an alternate selection for my daughter to choose from, and managing a list of substitutions for my wife’s meal. Every traveler has a range of experiences when traveling. Sometimes, the little things make a huge difference. Our trip was made all the nicer because of wonderful service by the people at the Hilton hotels where we stayed; this has been our typical family experience with Hilton properties over many years. In this case, they even helped avert a big disappointment caused by National Car Rental (boo!) — which, by the way, has never sent me any notice about the reservation cancellation, or any explanation, and certainly no apology (big Boo, Hiss!). I will not rent with National again unless forced to (my employer has some rules for within the US), and you may wish to use my experience as a warning. On the other hand, our experience with all the Hiltons was quite good, and we don’t hesitate to recommend them!